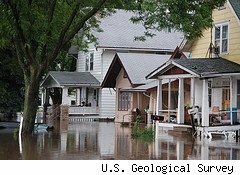 Flood insurance is only available through the federal National Flood Insurance Program, and this program is scheduled to expire in March. Now groups are lining up on both sides of the question of whether to include wind damage in the coverage. The Hurricane Katrina experience showed how difficult it can be to separate damage from moving water from that caused by wind. U.S. Representative Gene Taylor of Mississippi has proposed the Multiple-Peril Insurance Act, which would expand the government's program to include wind damage. Taylor accused major insurers of ducking payment for damages from the hurricane by claiming that damage was due to flooding, which was not covered under their policies, rather than wind, which was. Taylor believes that by bundling wind and flood damage, claimants will never again be caught between two insurers. He also pointed out that many major private insurers now refuse to provide coverage to those living along the coast in areas particularly at risk from hurricanes. Insurance groups such as the Property Casualty Insurers Association of America oppose the bill, claiming that wind coverage is readily available through private insurers and state-sponsored wind pools. It states that 99% of all coastal properties in the U.S. already have access to windstorm coverage and, in lost taxes alone, the affected states and the U.S. government would lose $1 billion each if the legislation is passed. The Obama administration supports renewing the program without wind coverage. I suspect that public opinion will split along familiar lines -- who do we distrust more, the government or private insurance companies? Bundling wind and flood coverage would still leave homeowners in need of other coverage for fire and such catastrophes. If this insurance is available at a price point that makes business sense for the vendors, then it makes sense to me that we allow the private sector to handle it. If the price doesn't make business sense to a private company, then I conclude that in a catastrophe the taxpayer will once again be subsidizing the cost of the insurance settlements. Isn't it time that those who rebuild and live in perilous locations be expected to carry adequate insurance to cover their households, without depending on government subsidies?